Cave enthusiasts are spoilt for choice when it comes to caving in Malaysia where there are hundreds of caves to explore ranging from those found in the vast and remote Mulu National Park, a World Heritage site, to popular tourist spots like Batu Caves. The Bahasa word for 'cave' is gua and a glance at the map below shows that they can be found all over Peninsular Malaysia, mostly in limestone hills (karst towers) and the majority are above ground. Sarawak has even more spectacular caves. The caves at Mulu include a number of superlatives; the world's largest cave chamber (Sarawak Chamber), the world's biggest cave passage (Deer Cave) and the longest cave in south east Asia (Gua Air Jernih, a massive 189km long).The locations of the Sarawak caves listed below are included on the map on my Top Sarawak Attractions page. Mulu to be added when I have had the chance to visit it. Some caves are more accessible than others. Gua Tempurung for example is close to main roads with parking available while Gua Musang in Kelantan and Batu Caves near KL can even be reached by train. Others such as Gua Cerita, with its Quranic inscriptions, can only be reached by boat. Limestone caves typically have magnificent formations of stalagmites and stalactites. If you are never sure whether it is stalagmites or stalactites which grow upwards, my geography teacher at school liked to joke that the way to remember which-is-which is to think of "Tights coming down". It was a pathetic joke but I have never forgotten it. To enjoy caving in Malaysia you need to be comfortable with the types of creepy-crawlies that you might find living in them. Plants cannot grow deep inside caves where it is pitch-black. Instead, it is the millions of bats inhabiting Malaysia's caves which support the cave eco-systems. Bats emerge from the caves every evening to feed and when they return they deposit their droppings (guano) - huge piles of it - on the cave floors. The guano mounds form the basis of the caves' food chain which includes worms, beetles, spiders, cockroaches, centipedes, scorpions and snakes. In Sabah, Gomatong and Madai caves are home to colonies of swiftlets whose nests are harvested and sold to make the expensive delicacy birds' nest soup. - Adventure Caves - (A) Often involve scrambling over rocks, wading through waist-high water in the dark and getting dirty (more for serious speleologists). - Temple Caves - (T) Caves which are used as places of worship, usually Buddhist or Hindu. Click on the respective cave for more details. Why spend USD50 on a half-day tour of Batu Caves when you can easily go by yourself for just USD4, including lunch! Both caves at Gua Kelam Recreational Park were closed for repairs but I managed to get a private tour of number two cave. A great experience. Gunung Reng is a spectacular limestone outcrop containing a bat-infested cave. Curious legends surround the hill's origins. Gua Tempurung near Ipoh is the largest show cave in Peninsula Malaysia. A variety of tours are possible ranging from easy to challenging and adventurous. A great place for caving in Malaysia. Perak Tong Cave Temple is one of Malaysia's top tourist attractions. The cave contains a 40 foot high golden Buddha and beautiful murals. 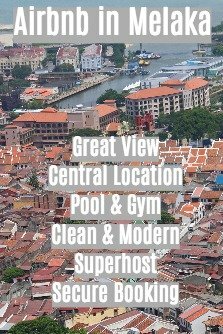 Climb 450 steps for a great view of Ipoh. Sam Poh Tong is one of Ipoh's most popular tourist attractions featuring an interesting cave temple and beautiful ornamental gardens. 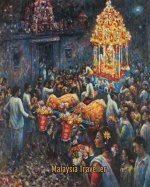 Recently I had a spooky experience at Nam Thean Tong, one of Ipoh's oldest and darkest cave temples. Read about it here. 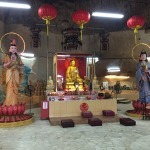 Tokong Da Seng Ngan is a cave temple situated at the foot of Gunung Rapat in Ipoh. It was lost under mud for thirty years before being restored. Ling Sen Tong looks more like a Chinese mythology theme park than a cave temple but it is worth visiting. You can buy Ipoh's famous pomelos here too. Perak Kwan Yin Tong is a cave temple at the foot of Gunung Rapat in Ipoh. It is dedicated to Guan Yin. Kek Lok Tong is, for many, the favourite of Ipoh's numerous cave temples due to its spacious and airy feel and attractive lake garden. This is not really a cave at all but this Neolithic rock art, painted on the wall of a limestone cliff, is well worth seeing. Find directions here. Caving enthusiasts will appreciate Gunung Senyum Caves with 25 varied caves to explore, some easily accessible while others require a climb. Gua Charas (also known as Gua Charah or Panching Cave) contains both Buddhist and Hindu symbols including a reclining Buddha statue. See a slide show of what's inside. This is one of Malaysia's most spectacular and famous cave complexes, located within a pristine national park. Read a practical guide to Niah Caves here. Wind Cave Nature Reserve provides visitors with an authentic caving experience in pitch black bat-infested tunnels. Gua Ikan is a cave complex worth exploring but you may need to hire a guide to appreciate its full extent. Pulai Princess Cave contains a fine Guan Yin statue carved from a large stalagmite. The cave is also known as Zhi Xia Dong or Zi Xia Dong. Gua Bama is a cave near Kuala Lipis in Pahang. Bats, cockroaches and archaeological dig remains can be found here. If you would like to learn more about the scientific aspects of caving in Malaysia I can recommend the Caves and Limestone Hills of Malaysia website written by Liz Price, an expert speleologist.